After trying out many recipes from the Turkish Cuisine, I took the courage to try out Börek, which i always thought would be a very difficult one. 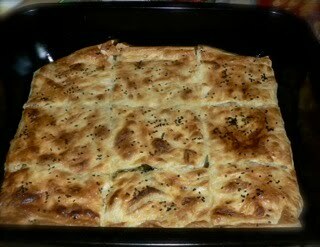 I have eaten Börek in almost every Turkish friends' place and in every gathering in a Turkish mosque, everytime wondering and appreciating the cook there. But unless you give it a try, you wont know how simple and easy it is ...isnt it ? I am glad that my first try was very satisfactory and successful! Börek is a common term for all pastries that use Turkish yufka i.e. phyllo dough. 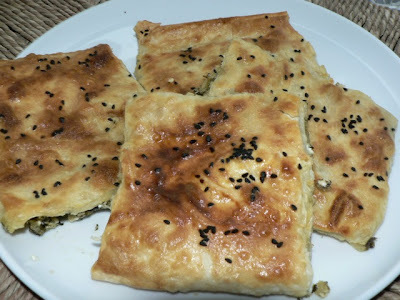 Depending upon the filling, the shape and sometimes the region, the term börek is preceded by a descriptive noun : Kiymali börek (Mincedmeat börek), or ispanak börek (Spinach börek) and the most common style being a layered one. Tepsi in Turkish literally translates as "tray". Spinach börek is defintely the nation-wide favourite and my favourite too ! 1. Heat the oil and add the potatoes, spinach (thaw the spinach first, if using a frozen one), salt, garlic and pepper and fry for about 4 minutes. 2. 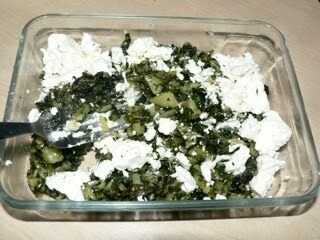 In a small bowl, mix this potato mixture and the goat cheese and mix well with a fork. 3. 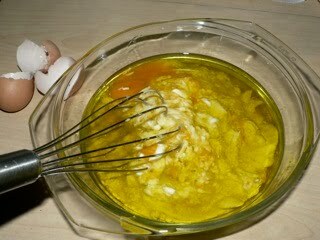 In a separate bowl, add the olive oil, milk and beat in the 2 eggs and mix well to form the sauce. 4. Grease a deep bottom tray, approx. 8 x 11.5 inches, with olive oil( or a pan that is approximately the same size with the phyllo sheets). 5. 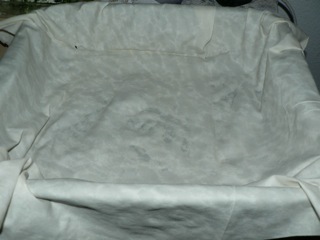 Layer 1 phyllo sheet in the tray. 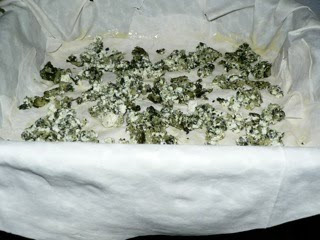 Leave the overhanging phyllo to the sides for the final wrapping. 7. 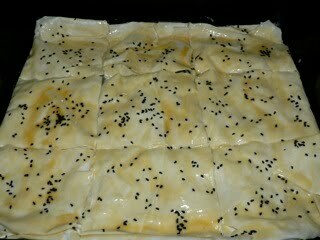 Repeat this layering of phyllo for 3 sheets, brushing every single layer generously with the sauce. The phyllo layered here should not be overhanging, just cut them into small sizes or bits and pieces to fit into the tray. They need not be very perfectly shaped.The idea is to just cover the underlying sauce ! 8. 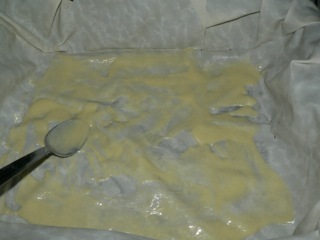 After the third layer of phyllo, do not add the egg sauce. Place the filling now and cover it again with another phyllo layer. 9. Keep repeating the alternating process of sauce and phyllos. (You could layer as many layers as you want depending upon your available phyllos and sauce). 10. 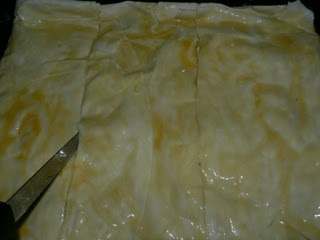 Finally tuck and wrap the overhanging first phyllo on the top to cover all the underlying layers. Pour over whatever is left from the sauce on top. 11. Give an egg wash by brushing the surface with egg yellow. 12. Cut the phyllos in small square pieces with a knife, like how you cut a cake. 12. Sprinkle nigella seeds on the top. 13. Place the tray in a preheated oven at 180°C and bake it for about 30 minutes until the surface turns golden brown. 14. Wait for 10- 15 minutes and cut again on the pre-cut squares and serve with tea ! 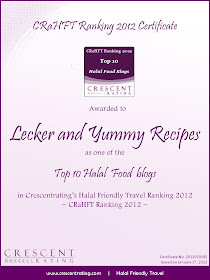 This recipe goes to the event Iftar Moments, hosted by Umm Mymoonah of Taste of Pearl City. This recipe also goes to the event A.W.E.D Turkey, hosted by the the taste space, originally started by DK.